Global mobile broadband subscriptions have passed the 2 billion milestone, according to newly published statistics from GSA. There were 126.1 million LTE subscriptions (Q2 2013) and this figure was expected to have topped 150 million by the end of September 2013. 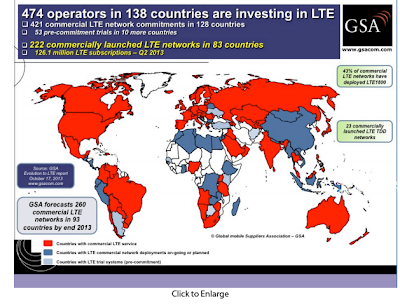 There are currently 222 commercially launched LTE networks in 83 countries, rising to 260 commercial LTE networks by the end of the year. 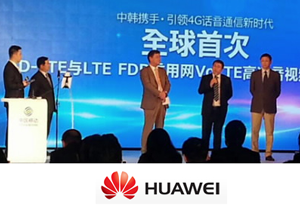 23 commercially launched TD-LTE networks in 18 countries, of which 11 are dual mode FDD + TDD systems. More trials are underway. There are 274 LTE TDD devices on the market. LTE-Advanced is a commercial reality already with several networks in South Korea using carrier aggregation. The first wave of VoLTE service launches that include support for HD voice (using W-AMR) has begun. Many operators have committed to VoLTE deployments or trials in 2013-2014 including KT, LG U+, SK Telecom, Evolve Broadband, T Mobile Austria, Azercell, Sasktel, China Mobile, E Plus, O2 DE, CSL Limited, Bharti Airtel, RIL, NTT DoCoMo, Tele2 NL, Yota, StarHub, Telekom Slovenije, Tele2 SE, Etisalat UAE, AT&T, C-Spire, MetroPCS, US Cellular, Sprint, Verizon Wireless. 55% of phones sold in Q3 2013 were smartphones, compared to 50% in Q1 2013. 80% growth in data traffic between Q3 2012 and Q3 2013 driven mainly by video. Virtualization – VMWare, Citrix and Microsoft are all working to extend their platforms to encompass network virtualization, and network service providers need to manage both the end to end transport of storage and virtual machines, and network virtualisation tunnels. How to make sure that a unified management layer can be rolled out across a network, and meet the deterministic performance requirements of cloud traffic? The role of Network Function Virtualization (NFV) in this process is also considered. Automation – automated creation and deployment of VMs is evolving quickly. Storage can be established in seconds, but network automation lags far behind. Vendor independent protocols and standards are needed to accelerate network automation and delivery and creation of services, particulary across multiple service providers – such as in a hybrid cloud environment. Security – the cloud is well established as a principle, data has become highly mobile, but regulatory and privacy laws must be complied with. For the cloud to remain on its growth path it needs robust structures to ensure end to end security. The industry also needs to formulate guidelines to inform the security decisions made by governments and regulators. Programmability – most routers and switches can be programmed by their makers, but few are open to third party APIs. 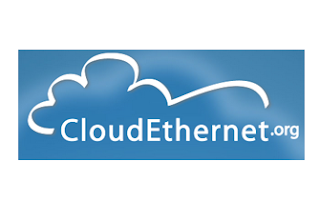 A number of groups – including ETSI and the ONF– are working on this within the domain of a single customer, but coordination is needed around the specific needs of cloud computing, and inter-provider service continuity. Analytics – A continuous exchange of information between the network and the cloud service providers on network and application service performance and requirements is needed, followed by real-time analysis of whether additional resources, either from the cloud or the network service provider, are required. Working groups are already being established by the CEF to address specific concerns, and members can get involved in shaping the future of the cloud computing. The overall Wireless Packet Core market grew more than 17% during the third quarter of 2013 versus the year-ago period, according to a new report from Dell'Oro Group. Huawei, Ericsson, Cisco and Nokia Solutions and Networks were the top revenue-producing vendors in the overall market. In the faster-growing Evolved Packet Core (EPC) segment, Alcatel-Lucent joined Ericsson and Huawei in the top three vendor list. Regions outside the North American LTE market are now driving EPC results, allowing a larger set of vendors to compete in the worldwide market. We expect EPC spending to accelerate in Europe and in China in coming quarters. New Network Function Virtualization (NFV) technology furnished by leading vendors is now being trialed by operators. We expect that in 2014 and beyond, operators will begin deploying NFV EPC systems. Additional services are being added along with EPC core networks, including Voice over LTE (VoLTE) and Rich Communication Services (RCS). These new systems will create additional vendor decisions for Service Providers as their networks are enhanced. The global carrier router and switch market (IP edge and core routers and carrier Ethernet switches) totaled $3.6 billion in 3Q13, an increase of 7% from the year-ago 3rd quarter, according to a new report from Infonetics Research. Sequential dips by Huawei and ZTE pulled Asia Pacific down in 3Q13, but Infonetics looks for the usual up-down pattern in the region to continue, giving rise to a strong 4Q13. Though Europe/EMEA declined 10% in 3Q13 from 2Q13, European service providers are expected to carry out a decent budget flush in the 4th quarter. 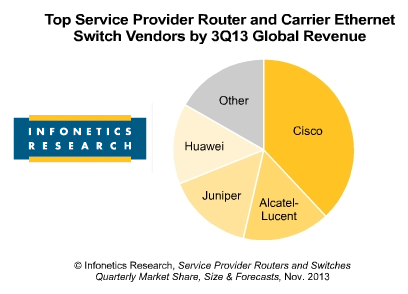 Cisco maintains its lead with 38%, Alcatel-Lucent regains 2nd place, Juniper holds #3, while Huawei drops to #4 on the 3Q13 global router/CES revenue share leaderboard. Infonetics forecasts the service provider router and switch market to grow at a 7% CAGR from 2012 to 2017, when it will reach $20.2 billion. XO Communications named Christopher Ancell as its new CEO, replacing Laura W. Thomas, who will remain with the company and assume the role of Chief Financial Officer, a position she previously held. Ancell most recently served as senior vice president of sales and sales engineering for CoreSite Realty Corporation. Prior to CoreSite, Ancell spent 12 years in a variety of leadership roles at both CenturyLink and Qwest, including president of CenturyLink's business markets organization and executive vice president of Qwest's business markets organization. The HomePlug Alliance applauded the approval of the IEEE 1901.2 Standard for Low-Frequency Narrow-Band Powerline Communications. The new standard enables urban and long-distance communications through existing transformers in the electricity distribution network using frequencies below 500 kHz, while supporting data rates of up to 500 kbps. 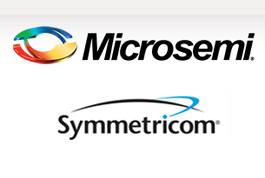 Microsemi completed its previously announced acquisition of Symmetricom for approximately $230 million, or $7.18 per share, representing a premium of 49 percent based on the average closing price of Symmetricom's shares of common stock during the 90 trading days ended Oct. 18, 2013. Microsemi said the deal enables it to offer the industry's largest and most complete timing product offering spanning from the core of the network to the edge and including the source, synchronization and distribution of end-to-end timing solutions. Symmetricom specialized in highly precise timekeeping technologies for data, voice, mobile and video networks and services. It provides timekeeping in GPS satellites, national time references, and national power grids as well as in critical military and civilian networks. The company is based in San Jose, California. Microsemi's other product lines include high-performance and radiation-hardened analog mixed-signal integrated circuits, FPGAs, SoCs and ASICs; power management products; timing and voice processing devices; RF solutions; discrete components; security technologies and scalable anti-tamper products; Power-over-Ethernet ICs and midspans; as well as custom design capabilities and services. The company is based in Aliso Viejo, California. "We look forward to integrating the talented Symmetricom team and leveraging our product and technology synergies to develop solutions that contribute to our customers' success," said James J. Peterson, chairman of the board and CEO of Microsemi. "We are eager to drive the business forward for our stakeholders as we continue to execute Microsemi's growth strategy." Copel Telecom, a wholly owned subsidiary of the Companhia Paranaense de Energia (Copel), has selected Coriant's coherent 100G technology to upgrade its optical backbone, which has been using the hiT 7300 intelligent transport platform since 2010. Copel Telecom's backbone network boasts over 9,330 km of fiber optic cables deployed between its main ring and urban radials (self-sustained cables), totaling more than 30,000 km and reaching more than 400 cities in south Brazil. "A robust backbone network allows us to support economic development and information exchange for both large and small enterprises, whose service needs also continue to evolve. 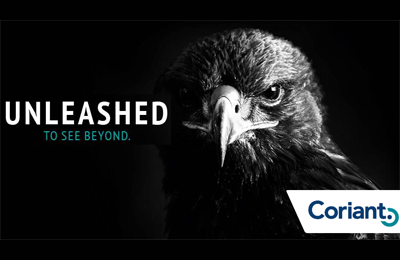 We chose Coriant's proven solution because it offers an exceptional level of flexibility in the provisioning of high-capacity services, and an easy upgrade path to transmission speeds of 100G and beyond," stated Antonio Carlos W. P. Melo, chief technology officer, Copel Telecom. China Mobile demonstrated international HD voice and video calls between its VoLTE trial networks in Chengdu and Hangzhou with the VoLTE network of a South Korean mobile operator. Huawei participated in the demo. Acacia Research Corporation confirmed that it has has acquired US patents and foreign counterparts related to cellular HSPA and LTE technology. The name of the seller and the purchase price were not disclosed. “We are rapidly becoming the leader in technology licensing and we continue to grow our base of future revenues by adding new patent portfolios," commented Matthew Vella, CEO and President of Acacia Research Corporation. 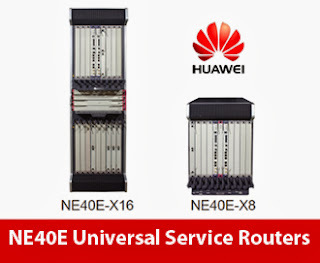 Spain's Jazztel will be the first operator in Western Europe to deploy the Huawei NE5000E 400G core router. The Huawei NE5000E core router allows 400 Gbps linecards, which support flexible networking of 100GE ports, 40GE ports, and 10GE ports. Financial terms were not disclosed. "The burgeoning mobile bandwidth services and video services are spurring the growth of backbone network traffic and present an opportunity for the 400G technology in the lab to make its debut on a live network," said Gai Gang, president of Huawei Carrier IP Product Line. "After years of comprehensive research on operators' needs for network reconstruction, Huawei is now playing a leading role in 400G platform design. With the 400G platform technology, Huawei aims to simplify operators' network architecture, improve device performance and capacity, and construct sustainable IP backbone networks."